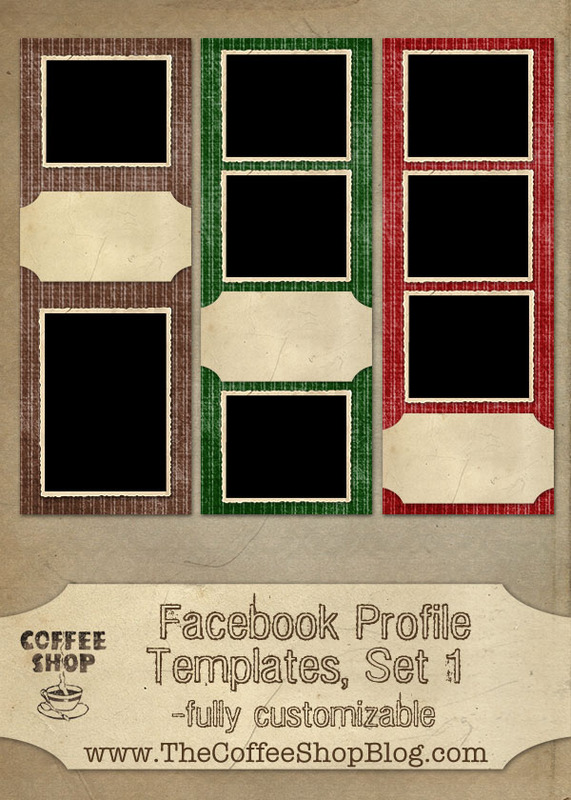 The CoffeeShop Blog: CoffeeShop Facebook Profile Templates! I don't know what is going on, but I am really inspired to create on the computer lately. Right now the kids are watching some Mighty Machines videos and I am playing on the computer. It is a rainy day and they have the week off from homeschool, so I decided to throw together a few projects for my blog before Thanksgiving and the out-of-town family arrive. I have had so many people request Facebook profile templates, so I made three for today's post. I just replaced my own profile picture using one of them. They are 180 x 500px layered .psd files with clipping masks. You can add your images using my Group It action and the background color is totally adjustable. I also have a few clipping masks tutorials. My images are highlighted in blue in the screenshot below. 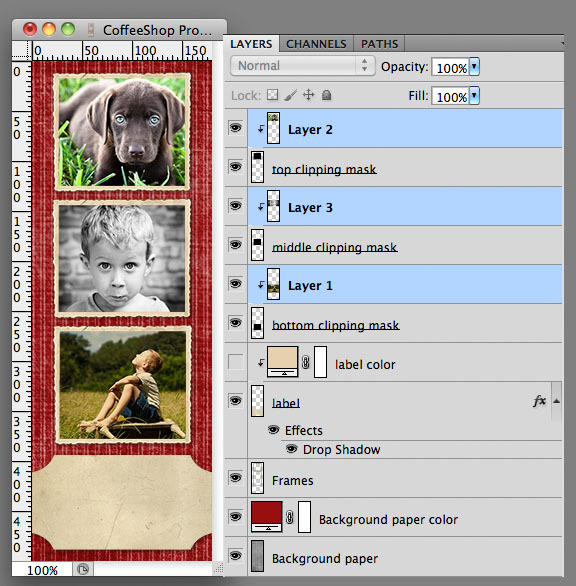 Just group your images above their clipping masks and Ctrl-T them to fit. You can also change the color of the background texture by clicking on Background Texture Color. If you want a solid color background just turn off the texture layer and then set the Background Texture Color layer to Normal blending mode. You can also change the color of the label by turning on the label color layer and clicking it to adjust. Add your text and logo to the label and you are good to go! I hope you enjoy playing with these. And if I don't get on the computer before then, Happy Thanksgiving to everyone!!!! SQUEEE!!! Thank you sooo much, Rita! Is there anyway that you could do more of a detailed description of how to do this. New to elements and would love to learn how to do this. First, I love all that you do on here and share! This template ziped file is saying I need a password, did I miss something? thanks again for sharing! No password necessary! Just try reloading again, it must be some fluke. Thank you so much for this post. I want to let you know that I posted a link to your blog in CBH Digital Scrapbooking Freebies, under the Page 3 post on Nov. 23, 2011. Thanks again. Thank you so much for sharing your time and talents! I love these, thanks so much! You're such a blessing!!! Rita, I would like to be able to print these, how big will they print? I absolutely LOVE this Template. THANKS is never enough for all the wonderful things you provide for all of us to enjoy. Thank you everyone! And Wendy, this is tiny, only 150 px wide so you can't print it too large. Yes, it is an image file, not an action! I'm new to the photoshop world. How do I intall the image file? Just open it like any other photo. :-) I have quite a few tutorials on using clipping masks on my blog, click on Tutorials on top. Thanks! I really appreciate your prompt replies and your fabulous blog! Keep up the good work. I'm having trouble with the image size I should be using. I need to re-size my HiRes photos, what size would be best? When I download this the png and the atn files are not there? Absolutely fabulous site - I have used a couple of your items and they are sooo easy to use - that tomorrow I am buying the whole pack! Having a blast making my website look different!